It’s tinsel season, so the competition is on for the best Christmas window displays on the high street to start attracting customers into stores. In just the same way that retailers plough millions into their Christmas adverts to mark the beginning of the festive season, retailers up the ante every year to create an alluring Christmas spectacle of their shop-front. And so, months ahead of the big day, the shiniest window displays and heart-warming in-store experiences are all prepared to deliver that ultimate Christmassy feeling. After all, every customer is always looking for a shop entrance that looks and feels welcoming. But it’s the shop-front that stands out from the crowd at Christmas that presents the ultimate attraction to get customers to step inside and start spending at the height of shopping season. One department store that is close to our hearts at Buckingham Coatings, and that is renowned for delivering on Christmas cheer, is Selfridges. Having worked with their flagship store in Oxford Street, London on cladding reparation and window refurbishment projects, we know their architectural excellence and attention to detail is second to none. The lasting impression of the building, window-displays and experience of being inside a Selfridges store is synonymous with their theatrical and artistic styled brand. It’s little wonder that their stores have become tourist destinations in their own right. Selfridges windows consistently attract tourists, designers and fashionistas to marvel at the designs and fashion trends on show. That’s probably why they’re always one of the first stores in the world to unveil their Christmas window display. This year’s showcase from Selfridges was no different. Two months ahead of time, shoppers could see Santa dressed up in an assortment of rock and roll outfits in Selfridges shop windows in London, Birmingham and Manchester rocking out their “Selfridges Rocks Christmas” theme. Taking inspiration from high energy rock and roll icons and fashion trends, customers were enticed into the store with the lure of star appearances from rock’n’roll Santa and VIP passes to see his backstage antics. 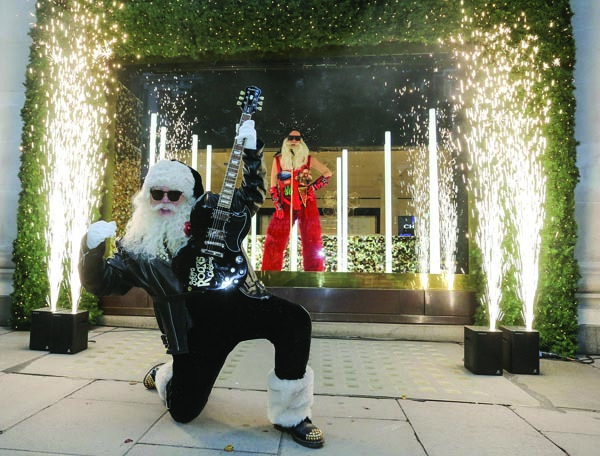 According to Retail Focus (- who detail how Selfridges’ Santa is having a rocking time this Christmas – as pictured above), it took a 500-strong team to produce their Yuletide scheme over the last year, and more than 100 people to put together the window-displays themselves. In delivering their sparkly explosion of glossy greens, reds and mirrored metallics across all their stores consistently, they have more than 85,000 baubles hanging from balconies and ceilings, over 65,000 pieces of paper confetti released from atrium cannons every day and 200 Christmas trees on display to complete the look. It’s clear that attractive window displays and innovative marketing techniques should be maintained all year round to keep things fresh and interesting for customers. It seems the top brands do this best, which is exemplified by retailers on the high street at Christmas. Not only is it the job of a shop-front window display and façade to capture the public’s attention in order to attract passers-by to come inside and do business, but maintaining a presence that looks good is also important for leaving a lasting impression that will keep you top of mind with customers. Visibility is an important factor to help you draw customers to your store, which makes good lighting an essential tool for achieving this goal too. As customers approach your store you want them to be able to see very clearly what you offer. Unnecessary signs or too many signs are not good for your store-front. Instead, adopt an easy to understand approach and make sure the look is consistent. Your customers need to be able to identify your store quickly and easily to help them speed up their buying decision. Particularly in a competitive market, giving your store a consistent look and feel will help customers identify your shop first, and differentiate it in their mind, before being influenced by another store-front design. Creating a welcoming space is key to a good first impression. Create a reception that will allow your customer to naturally transition from what they saw in the window to the culture of your store. This kind of atmosphere will create a welcoming feeling for your customers so that they continue their purchasing journey into your store, not out of it. A beautifully designed window display is not showcased properly without the building surrounding it presenting it well. Just like the right picture frame puts the subject of the picture under the centre spotlight, a well-refurbished window will frame your display to catch your customers attention at first glance. Maintaining your shop-front windows to keep them looking their best is crucial to uphold a professional image for your store. Signs of flaking paint or damaged architectural fixings should always be repaired and recoated to give the right impression at all times. Because attention-grabbing and good-looking window displays can easily be the difference between a potential buyer coming into your store to see more or continuing to walk by, the need for regular window refurbishment should not be underestimated. Window refurbishment is a way of keeping your store looking polished or taking the opportunity to revamp your facade completely for a fresh new look. You may choose to make a striking feature of your window display by colour-matching your window frame paint coating to the display scheme. Or you could take it a step further and adopt a full shop-front paint spraying to freshen up your premises. As with the best window displays, the extent of the visual transformation is only limited by your imagination. PreviousPrevious post:Queen Elizabeth Hospital, Woolwich, London – Cladding Repair & ResprayNextNext post:New Year. New Cladding Refurbishment.